for Our new Rabbit 'Parents'. 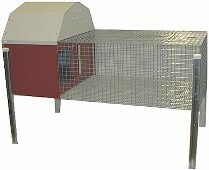 type cage for your Bunnies from our Online Cage Catalog. WE are located in wonderful Southern VT , near Mt Snow Ski Resort! So Again , WELCOME to Love Your Buns Rabbitry! Most of our website is contained on this one url (part of the quest for fewer pop ups!)... the first section is about our rabbits , then as you scroll down our cages and supplies, then last but not least some worthwile links are posted for your edification and enjoyment. 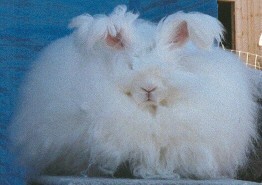 German Angora Rabbits Are WAY ADORABLE! You May Fall in Love with one & have to Have it! Our Bunnies are for Sale to Good Homes Only. If You Are Seeking Purchase Information from Us Please include your name, city, state. 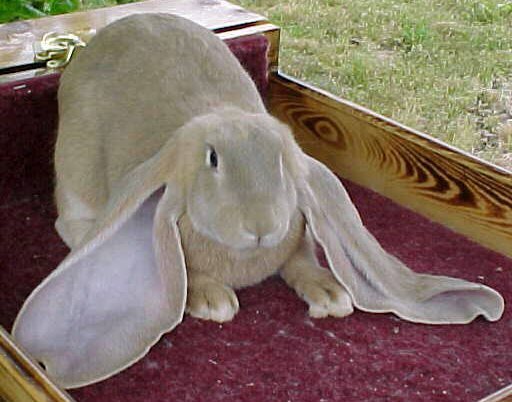 Please Tell us Why you want a Lop, As well as a bit about your Current Pet Experience and Home Environment. 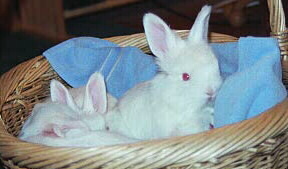 We Have the Finest in German Angora Available. All Love Your Buns' German Angora are 100% German, Pedigreed, with Excellent Temperaments and the Finest in Wool Yield/Production. Love Your Buns Rabbitry, Cage and Supply co.
A+ Qualitiy Cage and Supply Online Catalog This cage is called " My Favorite Rabbit Cage"
This Cage can be used as a single, set on floor or purchase 3 to use stacked . 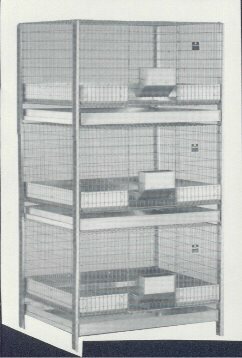 Each Cage Comes Complete With: Urine Guards, Deep 2 1/2" Galvanized Metal Refuse Tray, Inter-locking Legs, Bottom Support & Tray Slides. All doors are heavily reinforced & swing out for safety. The Feature I love about these cages is the door opening is floor level; Meaning no curb to catch & hurt bunnies feet or legs when lifting bunny in & out of cages. When cages are used as a Single We recommend Placement of a large Carpet Square on top of cage. This is great for resting bunny toys, treats & food . Our Economy cage has a swing in door (tricky to not hurt bunny or self w/that kind of door), -NO Urine Guards or Leg kit for stacking included (but available separately). Cages Made with 16 Gauge Wire. Refuse tray is not as deep or sturdy as the other model (this one is plastic) Cage measures 36w x 24d x 14h"
A beautiful alternative to a wire cage is our Rabbit Ranch. Barn roof opens for second access door and feed storage. Barn is constructed of red and white metal and includes a sliding front door. 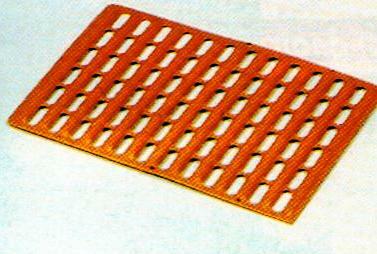 with 1" spacing (cage floor spacing is 1/2" x 1"). Provided rigid leg kit raises unit 23" off ground. Shipping, Handling & Insurance is additional. regular 8" x 12" x 8" $-please contact us for current price. 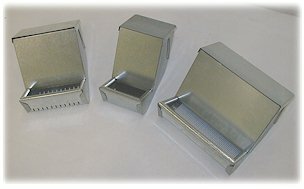 We Offer Foot Relaxer Floor Inserts! This Is Exactly what your Bunny Has been asking you for! rest & healing to tired sore hocks. You will want one of these in each cage! Provide Exceptional Results for healing red raw feet & hocks. Easily removable & clean up in soapy bleach water. Size 10x15" (Imported from Spain) Only $10.00 each /min order 3 inserts. All Orders Must Include UPS delivery Address w/Zip code. Recommended Bunny Books For Sale Here! Please cut/ paste your selection into an email to us to order, along with your name, UPS address & zip. Thanks! * Rabbits,Paul Paradise; HC, selection, housing, breeding, feeding, health  $10. lots of color photos throughout. Please send an email to see about ordering for this wonderful book. (book is oop no longer available in stores, we may have a mint new copy for sale) - include your home address street city state and zip. 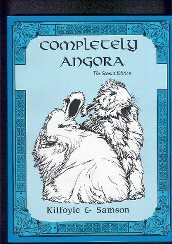 - we have just one left at $200, for autographed mint copy never read. Our Buisness Is Keeping Every Bunny Happy! Love Your Buns Rabbitry thanks You For visiting Our Cage Page times. seeking assistance or fellowship staying sober? try joining this site for help/ fellowship. Love Your Buns is a member and we would like to personaly invite you to join this club!